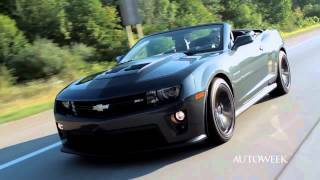 DETROIT– Chevrolet announced today the brand’s most-powerful convertible ever – the 2013 Camaro ZL1 – will debut at theLos Angeles Auto Shownext month. When it goes on sale in late 2012, it will deliver more performance and technology than many exotic cars and ultra-luxury convertibles. 2012 Aston Martin DB9 Volante – 470 hp / 443 lb.-ft.
2012 Mercedes SL63 AMG – 518 hp / 465 lb.-ft.
2011 Porsche 911 Turbo S – 530 hp / 516 lb.-ft.
2011 Ford Shelby GT500 – 550 hp / 510 lb.-ft. 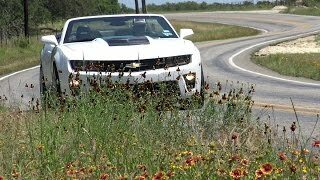 The Camaro ZL1 convertible’s power is complemented by advanced powertrain and chassis technologies designed to deliver exceptional performance on the road or track. In fact, it’s the same balance of acceleration, handling and ride quality that enabled aCamaro ZL1 couperecently to lap the Nürburgring’s Nordschleife course in 7:41.27 minutes. Front “X” brace and stiffer cradle as well as rear underbody “V” braces. Additional structural reinforcements in the ZL1 convertible are designed to improve noise and vibration characteristics, while also reducing unwanted ride and body motions. They include a hydroformed tube in the A-pillars, an inner reinforcement bracket in the windshield header, a reinforced front hinge pillar and reinforcements inside the rockers. The suspension of the ZL1 convertible uses the third-generation of Magnetic Ride. New, twin-wire/dual-coil dampers at all four corners enable faster response, with damping levels now adjusted up to 1,000 times per second – about one adjustment per inch of vehicle travel at 60 mph – making the system exceptionally responsive to changing driving and road conditions. The Camaro ZL1 convertible will also offer Performance Traction Management as standard equipment, which is exclusive to General Motors. First introduced on the Corvette ZR1, it is an advanced system that integrates magnetic ride control, launch control, traction control and electronic stability control, to enhance both launch-acceleration performance and corning. The result is a convertible designed to preserve nearly all the acceleration, road-holding and performance capabilities of the Camaro ZL1 coupe, which goes on sale in early 2012.